Zero day vulnerability allows “remote code execution” – it’s super easy for a hacker to view your Windows OS files or install viruses on your PC via Internet Explorer (and you won’t know it’s happening). Zero Day affects every version of Internet Explorer currently on the market, from IE 6 upwards. Firefox, Chrome, Safari and Opera are unaffected – unlike IE, Microsoft won’t let these browsers access Windows OS while you’re surfing the web. Install EMET to protect your PC. As tested by Fireeye, EMET 4.1 and 5 do help to break the exploit. Enable the IE “Enhanced Protection Mode” (EPM) which became available in Internet Explorer 10 and later versions. 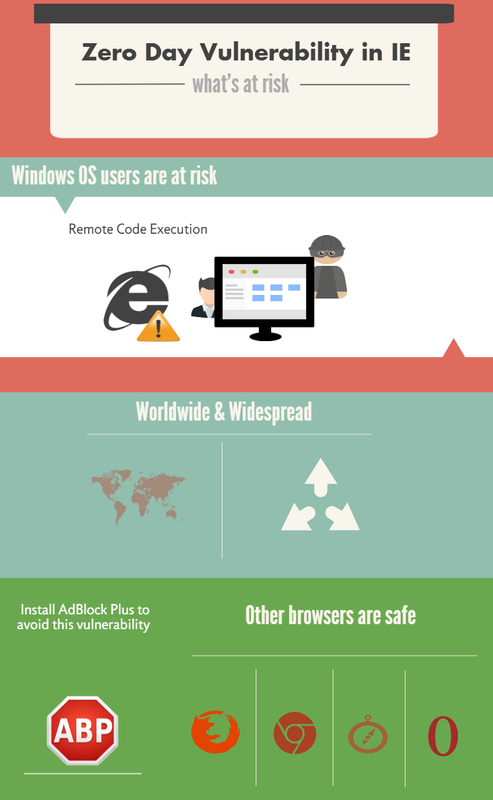 We recommend switching to Firefox and installing Adblock Plus to avoid this vulnerability. You’ll receive regular updates on the latest security threats, plus in-depth tips on email and website marketing.